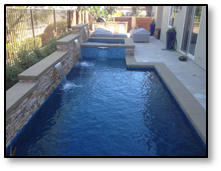 After 27 years of landscape design and installation, we at SNYDER & ASSOCIATES understand how big a job it is to build a swimming pool and spa. It’s not quite as much work if you’re resurfacing and re-tiling an existing pool and spa, but there are still lots of decisions homeowners need to make. Start Early! When you see the other 9 items on the list, you’ll understand why we put this tip first. The more information you have, the less stressful and the more confident you will be that you are spending your money wisely. Starting early gives you time to do that. Plus, you’ll be happier with the outcome—which is our number one goal. Establish a budget. Even before you start looking at ideas, it’s great to decide how much you would like to spend. Then, as you go through the process, you will at least be conscious of those things that you really want, and those that are budget busters. Be sure to communicate the magic number to your pool builder. When thinking about your budget, also take pool maintenance into consideration. Are you willing to do the labor or will you hire a professional? Ask about control systems to operate pumps and heaters, disperse chemicals, clean debris, and manage the lighting. Create a scrapbook of ideas. Collect photos from various sources to determine the types and styles of swimming pools and spas you like. You can find lots of great photography on our website and here. You can go “low-tech” and look at magazines from the library or newsstands. Then let your landscape designer see your ideas so they can help you with the next steps. Utilize trusted resources. Check out prospective designers and swimming pool builders with organizations like the California State License Board. We are licensed and bonded, and have a great YELP rating. Also talk to family and friends: referrals are a wonderful resource. Don’t leave this important task to luck. Choose your location wisely. Such things as soil condition, privacy considerations natural surroundings, and views should be considered. You may want a location, but the contractor may have good reasons for a different site. Think about how you will use the swimming pool and spa. Will it be for children? Do see yourself entertaining into the wee hours? Do you swim laps? How and when you use your pool may require additional options like a specific kind of heater, accent lighting, kid-friendly diving boards or elegant waterslides. Research local building codes. SNYDER & ASSOCIATES will help you pull the proper permits, but you may still want to check before calling us. Most cities have ordinances stating how far away a swimming pool, spa and pool equipment must be from another property or road. We know all this, but it’s good for you to know, too. Save the planet and save money. Using ecologically friendly equipment will help save precious energy and save you money. Also, depending on where you live, your local or state government may offer incentives for eco-friendly installations of swimming pools and spas. Don’t forget insurance. Chat with your agent to make sure that your swimming pool and spa will be covered by your homeowner’s policy. Be safe. Create layers of protection to safeguard children, animals, and other guests around the pool. Look into swimming pool barriers such as safety covers, fencing, and alarms. Still with us? Great! Call us. We’d love to get an early start with you to make your swimming pool and spa experience a good one. SNYDER LANDSCAPE & ASSOCIATES is a licensed, insured, award-winning company that has helped our clients enjoy their outdoors for over 27 years. Let us know how we can help you achieve your dreams.